Adventist leaders are calling for prayer after the 7.9 earthquake in Central China killed thousands, destroyed buildings, and left many people buried. Several Adventist Church members have died and several are buried, said David Ng, a ministries director for the church’s Chinese Union Mission. “Please continue to pray for those families who have suffered and those who are helping,” Ng said in a May 15 e-mail. Ng said eight Adventist churches were destroyed. The Adventist church in the city of Chengdu has gathered limited funds to purchase food, water, and other necessities to distribute, Ng said. 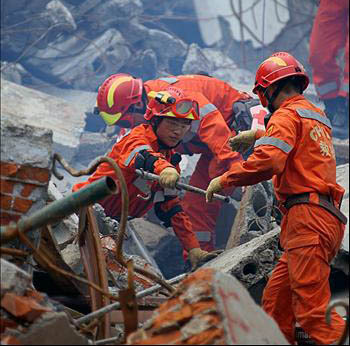 Chinese officials say 80 percnet of the buildings have collapsed in Beichuan county in Sichuan province, home to 7,210 Adventists. The church’s Chinese Union Mission has arranged for fellow workers to visit church members in the disaster area.